Several months ago, I reported about a "Philly Fight Night". We're talking real boxing here. Well, there's been another Fight Night recently. 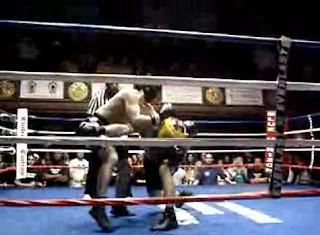 Per youtube's mccopock1, "In a stunning victory for the Wharton Community, Itai Lemberger knocked out his Penn Law opponent at 2008 Philly Fight Night. Itai's match was the main event for the night, but it didn't last long; the poor sap from Penn Law was laid on his back 30 seconds into the first round of the fight." Click here to watch the fight!